An 18th-century portrait sold in New York to a British gallery as a "woman in a feathered hat" turns out to actually portray a man dressed as a woman, becoming the earliest known painting of a transvestite. Image courtesy of Philip Mould Ltd.
"The transvestite painting, now called the "Chevalier D'Eon," is currently hanging in the Philip Mould Ltd. gallery in London and will possibly become a permanent feature in the British National Portraits Gallery, said art dealer and art historian Philip Mould, director of Philip Mould Ltd.
"We spent 30 years honing our skills at looking at British portraits, and you begin to spot anomalies," Mould told LiveScience. "Portraiture, despite the diversity of odd-looking people in the world, particularly in the 19th century, before advances in cosmetic science and dentistry and medical advances had taken place, but portraiture is always extremely straight-laced." The finished portrait was typically a compromise between the artist (who was painting what he or she saw) and the sitter (who wanted to look their best); that means anomalies of facial features can be subtle. "Something about the "muscularity of his face" and a "suggestion of stubble" caught Mould's eye as odd. So Mould and a team of his "lost faces bureau" went to work to figure out the sitter in this painting, and along the way ended up finding the actual artist of the work. "Once the painting had been cleaned and restored, "his masculine traits became far more manifest," Mould said, including the masculine-angled face shape and the facial hair stubble. The other thing they noticed was the signature of the artist, which had been listed as Gilbert Stuart, actually was "T. Stewart." Putting the pieces together, including the fact that Charles D'Eon spent a fair amount of time on the stage fencing, the team nailed down the painter as Thomas Stewart, who also spent a lot of time in the theatre, Mould said. "Since the painting's unveiling this week, "we've had an interesting succession of individuals coming to pay homage," Mould said. "It's a combination of mirth and respect for a man who was bold enough, brave enough, but also extrovert enough to state his case." In fact, D'Eon apparently lived the second half of his life as a transvestite during a time when cross-dressing was essentially unheard of. "Here's how D'Eon's transvestitism came to pass: He joined King Louis XV's secret service in 1755, had his first major military posting in London in 1763, before being appointed Plenipotentiary Minister to London. However, within months, he had a falling-out with the ambassador appointed to replace him in London, accusing the ambassador of trying to murder him. D'Eon also made public secret documents and ended up being sent to prison, which he escaped. "Once escaped, D'Eon concealed his identity, reportedly, by dressing as a woman. Gossip about his gender began in 1770, with rumors that people were even betting on whether he was a man or a woman. "D'Eon refused all offers to confirm or deny the rumor," Simon Burrows, professor of modern history at the University of Leeds, said in a statement in 2010. "He also demanded the French government pay off his debts and they agreed, terrified he would betray state secrets, including plans to invade England." "And after that, apparently D'Eon was forced to adopt female dress, and others accepted him as a female. So much so, that the truth was only revealed upon a medical examination after his death on May 21, 1810, which revealed his very male anatomy. Reportedly, his housekeeper did not "recover from the shock for many hours," according to the gallery. The term "eonism," which is used in psychiatry to describe male adoption of female dress and manners, was derived from D'Eon's name." OK, so the painting was sold in New York and then shipped to the UK. Exactly on what basis the painting was declared to be the earliest transvestite portrait really isn't mentioned in the article. From reading Mr. D'Eon's biographical note on the web, however, a date for the painting in the second half of the 18th century is certain, particularly after 1770 when his cross-dressing became habitual and tongues started wagging. BUT, there is another transvestite painting, with strong connections to New York City and also to the 18th century British government, that has been "out" for a very long time, and is on permanent exhibit at the New York Historical Society. It's subject is well-known and its story circulates at intervals as writers and reporters discover it by chance, or by historians researching the period. Cornbury came to be regarded in the historical literature as a moral profligate, sunk in corruption: possibly the worst governor Britain ever imposed on an American colony. The early accounts claim he took bribes and plundered the public treasury. Nineteenth century historian George Bancroft said that Cornbury illustrated the worst form of the English aristocracy's "arrogance, joined to intellectual imbecility". Later historians characterize him as a "degenerate and pervert who is said to have spent half of his time dressed in women's clothes", a "fop and a wastrel". He is said to have delivered a "flowery panegyric on his wife's ears" after which he invited every gentleman present to feel precisely how shell-like they were; to have misappropriated £1500 meant for the defense of New York Harbor, and, scandalously, to have dressed in women's clothing and lurked "behind trees to pounce, shrieking with laughter, on his victims". Cornbury is reported to have opened the 1702 New York Assembly clad in a hooped gown and an elaborate headdress and carrying a fan, imitative of the style of Queen Anne. When his choice of clothing was questioned, he replied, "You are all very stupid people not to see the propriety of it all. In this place and occasion, I represent a woman (the Queen), and in all respects I ought to represent her as faithfully as I can." 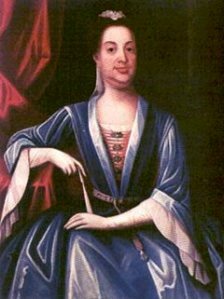 It is also said that in August 1707, when his wife Lady Cornbury died, His High Mightiness (as he preferred to be called) attended the funeral again dressed as a woman. It was shortly after this that mounting complaints from colonists prompted the Queen to remove Cornbury from office. 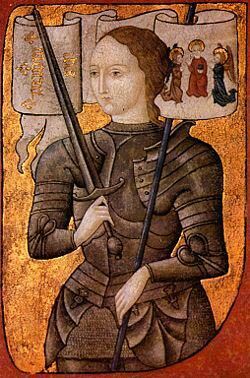 The very well-known Joan of Arc who, once she began her famous mission to lead the French in ousting the English from France, renounced female clothing completely. This painting dates from 1485. Wow! I never knew and this is so interesting. Wow, Will (oops... Mark already said that)! Another truly fascinating post. Thanks! yes, that is a man in drag - who could miss this?